It might have been any holiday weekend at our place. In-laws at table sipping coffee, nibbling at cinnamon rolls and fruit. All of them, each of them, in turn, making fuss of one sort or another over our two daughters. It was leisurely. I went for a run that morning. It might’ve been an oddly tranquil Thanksgiving morning, a slight hum in the background. Lots to do but plenty of time. We kept the girls home from school that day, not a holiday at all, just a Monday in April. My mother arrived at around nine, up from Corpus Christi for the day, followed by my father and stepmother in from Colorado. They’d had breakfast at the hotel. Everyone was nervous and giddy. Sort of. We were done after this one, and maybe the day felt special in its own way for that reason. It was the first time my father and stepmother had been able to come for the birth of one of our kids. My wife’s sister had come for the births of both her nieces and was supposed to be in the delivery room for number two. She had been bumped at the last moment due to speedy progress and unfortunate timing. She would be in the delivery room that day unless a higher being had a say. Otherwise we felt that we knew what was in store for the day. This wasn’t our first rodeo. It was our third rodeo, and everything felt extremely controlled, accounted for, and serene. Every time I looked at the clock it felt like there were hours to kill. Plenty of time to check and re-check everything. Change of clothes. Toothpaste. Book. Magazines. Phone chargers. Laptop. Laptop charger. Camera. Batteries. Load the car. Grab some pillows. Hospital pillows are the worst pillows. Get an extra pillow. Next it was time to put the trash out to the curb – nearly forgot that. Now it was only 9:30 in the morning and we didn’t have to be at the hospital for two more hours. They told us to check-in at noon for an official 12:30 start time, but we knew to be there earlier than that. We would get to the hospital at a little after eleven for our scheduled inducement. Missus wanted to induce for the convenience of being able to plan a morning just such as this one, and to maximize her maternity leave and also to have her parents near to help with the girls when the time came. She had accounted for everything. We took pictures in the backyard, a warm spring morning. Missus, beautiful in front of her passion vine and lantana, belly stretching westward. Now with me. Now with the girls. Now all of us together. “Honey, put the cat down.” Now with her parents. Now she and her sister, both sweet, lovely and beaming. My oldest daughter hit wiffle balls thrown to her by my father-in-law for what felt like the entire morning. She was hitting bombs into the treetops and was extremely pleased with herself — many high fives. Somehow there was still time enough that we ended up lazily converging on the back porch and making guesses as to what Lucy’s weight would be, her length, and her eye color and hair color (would there be hair? a lot or a little?) and logging it all for later review. We all took our guesses, even the kids. We still have this sheet somewhere, I don’t know where. I was illogically guessing, hoping, for red hair with eyes green like mine – green is the rarest eye color; red hair is found nearly nowhere in our family. Hugely irrational, but you get to do that. Odds are she’ll have brown hair like the rest of us. My stepmother nailed the weight down to the hundredths of ounces. I nailed the eyes and hair (sort of). The plan was solid, plausible. It is adorable, in retrospect, how all of us knew in our collective minds on that morning that only a handful of hours later in the day, Missus would be propped up on pillows and looking tranquilly down, in all her maternal majesty, at the baby nursing peacefully at her breast. How we knew that we would soon be tearfully taking turns holding a third baby girl, the last in our brood, the circle complete. For this is the way these things happen. This was the plan. It was our plan. And it ended at the front desk. The obstetrician that was to handle our delivery was two weeks away from her own due date when last we met with her, a few days prior. Missus had seen a different doc in the group at each of her appointments, seemingly, only she had seen this one twice, felt a good rapport with her, a spry, bright and spirited person, and was pleased to learn that she would be her primary on the day of the delivery.The advanced nature of the doctor’s own pregnancy was certainly on our radar, but what were the odds of her going into labor on the same day or the night before? This was the news that met us at the front desk when we were checking in. Should have thought it a real possibility. Didn’t. No matter, though. Not a tragedy. We’d chosen the date more than the doctor, truthfully, and both mommy and baby were healthy, so good for them. The doctor now assigned to us was one Missus had met with a while back, a broad, no-nonsense type of woman whom she remembered well, and liked. And this was not a big deal, after all. She was an obstetrical doctor and not an auto mechanic, yes? After being shown to our delivery room in the nice, new and posh women’s wing of our local hospital we were introduced to the nurse assigned to us for the day, who seemed a bit confused by our arrival. She was puzzled, but not altogether put out. It was normally their lunch window. Highly unusual that we would be told to arrive before one o’clock, according to her. The nurse, forgivingly, said it didn’t matter anyway because she’d already had a chance to eat something. We apologized for the confusion and conferred with each other until we’d corroborated that we’d been told one, two, yes, three different times to plan and arrive for a 12:30 start. It amounted to a nonissue, being a little early rather than late, but her gentle words were tinged with forgiveness of an understandable mistake. Whatever. So the day moved clumsily forward. The nurse made friendly small talk while Missus changed and she gave us her resume while taking vitals, saying she was from New Jersey, originally, and had been doing this just forever. Over twenty years. Ready your shotguns and so forth. We praised her for her worldliness and marveled at our luck at having such experience and wisdom at the bedside as she went about her business and otherwise readied the mommy to be. I sent out the first text: “In the delivery room. All well.” I flipped through a magazine. I reached for my book and pretended to read. Not my first rodeo. Jersey Nurse became rude, territorial. When my wife got cold, her sister, a one-time hospital nurse, found and covered her in a warm blanket. I adjusted the room’s thermostat. These were gross violations, infringements upon Jersey Nurse’s authority and jurisdiction. She curtly reprimanded “whomever” took it upon themselves to perpetrate these transgressions while she was out of the room, and at this and we could not help but smirk and cut eyes at one another. Her transformation, slow and imperceptible for a time, was now becoming palpable, complete. It was an hour after the sac was breached that I asked Jersey Nurse when my wife would be checked for dilation. Missus was getting mildly uncomfortable. Labor was short with our second child, three hours, and general birthing wisdom implied that this one could progress even more quickly, possibly half as long. Not my first rodeo. Jersey Nurse flippantly replied that there isn’t a set protocol for that. That it takes a while for things to progress to that point, and patronizingly assured me that “checking” would occur exactly “later.” In other words: Not her first rodeo. We were in her world, and were not in control. I was standing with my mother in the hallway when I inquired again, maybe twenty minutes later, about the checking. By then I had myself convinced that I hadn’t worded the question well the first time, so indifferently had Jersey Nurse skirted, in my mind, an important bit of business. Instead of an answer, I was given a variation of her first dismissive reply as she casually walked by us without slowing. She was obviously letting me know that she’d done this a thousand times and that I was obviously just another nervous dad. My wife was growing more uncomfortable, which was making me uncomfortable, and I felt genuinely disrespected by her answer and the way that she gave it, walking by us and chomping ice. Of course, I speak not a word of this. I say nothing. Just shake my head and stand there, severely torqued. I’m a non-confrontational type, and at-heart a Texas boy that still too easily defers to elders and authority. I regret to this day not taking up for my wife, being more forceful. I understand better now the importance of being your own advocate in these situations, and when not to take their word for it. I go check in at Occupy Waiting Room and visit for a bit. So about fifteen minutes have passed since I last saw Missus when I walk back into the delivery room to find her past uncomfortable and well into P-A-I-N.
My wife is small, sweet, and seemingly fragile. But she is one-half Marine on her father’s side, not a complainer, and is going it without the epidural or anesthesia of any kind, as she did with our second child. She is questioning the wisdom of this decision now, and wondering if it’s too late. We all are.A conversation is taking place about the possibility of pain meds. She replies, less confident than before, and fumbling with her own hands, that as we are discussing pain medication, this is probably a good time. She gloves up. Makes her inspection. She casts a nod and a wink in my direction, turns to Missus and calmly tells her, “I am going to go and find your doctor. You are ready to have this baby.” I would love to hear some apologetic groveling at this point, but I don’t. I feel slightly vindicated nonetheless. About an hour-and-a-half later Lucy is among the air-breathing. I’ve cut the cord, held her momentarily before passing her to her mother, and she is now on her own table being cleaned, weighed, measured and otherwise inspected by a bevy of nurses. As with our second child, Missus had had some post partum bleeding — more significant this time — but it appeared to be under control. We’d warned Jersey Nurse and No Nonsense about this, and they assured us that they had taken the proactive measure of keeping certain meds at arms reach, understanding the probability that they would be needed. Moms who experience post partum hemorrhaging run the risk and likelihood of repeat occurrences in subsequent deliveries. Often the effects are exacerbated. Indeed the bleeding was worse this time through, and Missus required many doses of different drugs to get the bleeding under control. The doctor and nurses had to return several times to the bedside to address the bleeding and administer more meds. It was a good scare. For now, though, she is stable. We are finally breathing easier and she is ready to hold her baby again. Longer this time. I tell Missus that I’m going out briefly to allow her mother to come see her and Lucy. A few more people rotate in and out in accordance with delivery room head-count policy, and soon enough I am walking back to the delivery room with my father and stepmother — their turn to meet Lucy – when a nurse stops us at the door: The doctor would like to have a word with me. Entering the room, there is a man standing there that I’ve not seen today. Lucy is still on her table being looked at by nurses, some of whom excuse themselves to give us privacy, and soon the head count in our room is reduced to the bare minimum. Missus is on the bed and smiles an unnatural smile at me. I introduce myself to the man who, in turn, formally introduces himself to me. He is the neonatologist. Because of his thick accent I have to concentrate, avert my focus from his eyes to understand him as he explains that normally he oversees patients in the Neonatal Intensive Care Unit, and that under normal circumstances I would not be seeing him. He goes right into it: Full-on doctor speak. A blitz of words I’m not comprehending both because they are not intended for the ears of laypersons and because they’re heavily flavored with Latin inflection of a sort I’m not accustomed to. His words collide harshly with my head and I feel I’m four to five seconds behind as I try to decipher what he just said while a battery of new material exits his face and bounces off or sticks willy-nilly to my head. I’m catching words like chromosome and twenty-one and congenital but otherwise I feel like a nine-year-old standing in front of Phil Jackson, getting a collision-course on the Triangle Offense complete with X’s and O’s and a hard, lispy accent. I’m understanding that there is some gravity to what he is saying, though, and I make my way, finally, over to Missus. She’s hearing this for the first time too, and I should be near her. I sit on the bed near her middle. We share an unnatural smile. I kiss her head, wipe a tear from her cheekbone. I take her hand. I look back to the doctor and tell him, apologetically, that he is going to have to give all of that to us again. And a little bit slower, please. He smiles and nods, appreciates what I’m getting at. There is a long, palpable pause as we three share a collective deep breath before starting in again. It was in this moment — the heavily pregnant moment an instant before a doctor who is not supposed to be standing in front of you begins saying things you need to know; what is hanging over all in the room like an anvil cloud from which only he can extract meaning; this is the moment on which you hang, anticipating life-altering words – we stood exactly there, in that moment, in heavy silence, when a sort of mayhem erupted from the doctor’s breast pocket, startling us all. It was the Geico Pig. Not low volume. I don’t know how long it took the doctor to extricate the cell phone from his shirt pocket and complete the action of quieting the pig, but it had to have been no less than a minute. Probably more like ten or twelve seconds. I’m not sure if it felt longer for us or for he, the doctor, who had to have been solidly mortified, but covered it well, and offered several times “I am sorry” while trying to quiet the pig. I would later wonder to myself whether or not, in those strange moments, God was trying to tell us anything. That maybe all would end well. That this was not so blamed serious. That, as in all things, His divine nature encompasses the unknowable realm of comedic timing? The pig adequately subdued, our doctor offered another, very genuine “I am very sorry,” before resuming his course. Again with the X’s and O’s. I interrupt. He lists the accumulating reasons that there are to believe that Lucy has the condition called Trisomy 21 or Down syndrome. He looks at Missus to make sure she hears him say that this could not be prevented, and that she did not do anything wrong. He goes on to say that the fact that Lucy is not oxygenating quite adequately (something we were aware of, and the reason nurses were still focused on her and had called him in) could point to a congenital heart defect, which is not uncommon in babies born with Down syndrome. We processed the Down syndrome thing easily. Next to the words congenital heart defect, Down syndrome was easy to ingest. These other words, however, took the warmth out of me. We thanked the doctor and he left the room. Alone now, we sat together silent for a time and hugging. We slowly agreed that, really, there was no problem. Down syndrome: not scary. We’ll figure it out. The heart defect thing: A little scary. Well, very scary. But we don’t know about that yet, and chances are decent that even if there is a defect she won’t need surgery. Missus talked about holding Lucy that first time and how, looking at her, she’d had a feeling. She asked me if I had had a feeling. I couldn’t say that I was as certain as she was when I first saw her. Obviously, when your child is born you’re overcome with joy and relief and riding the happy moment. Thinking back, though, I can recall looking at Lucy as I held her and watching as her eyes rolled weakly up in a way that seemed – not normal. Not controlled. It was over quickly when her eyelids closed and, not wanting to alarm myself, I chose not to worry or think about it. It may have had nothing to do with her Down syndrome. I suppose, though, thinking back on holding Lucy for the first time, I can say that I, too, had had a feeling. If only a fleeting one. I can remember the day Missus and I had the conversation about foregoing the amniocentesis. It was the day before the appointment and we had something going the next day. I don’t remember what. It wasn’t a big deal, the conversation. In fact, once I had Missus recount for me exactly what the purpose of the test was, and how obtrusive it is, I was even quicker to blow it off (this happens to be my position on a lot of things). In my mind it was simple: If you know you’re not going to terminate the pregnancy then why find out? Missus reminded me that people still like to know — to prepare and educate themselves for the road ahead. But she also brought in a different perspective. And the one that, in the end, solidified our decision to skip it. Our good friends have a daughter who was born without her corpus callosum. The corpus callosum is the band of nerves in the brain that separates the two hemispheres and aids the transfer of, among other things, motor, sensory and cognitive information between the left side and right sides. Kiddos born without the corpus callosum have significant cognitive and social deficits and, while there are far worse impairments, this is a difficult path.Now, Mia is a beautiful, delightful child, four years old, with amazing parents — both of them — and a big brother and the four of them seemingly skip along this “difficult path” like it were the yellow brick road. For our conversation, though, Missus was thinking of the pregnancy, and how they’d learned early on that there were signs of trouble. The sonogram flagged multiple qualifiers that pointed to a wide variety of possible diagnoses, Down syndrome among them. And while they didn’t learn until birth about the corpus callosum, and what it would mean for Mia and to their lives, the entire pregnancy was fraught with tears and with fear of the many possible complications associated with the many possible conditions that Mia might or might not have been born with. Whether or not our decision was the right one is an open question and one that is couple specific, subject to countless emotive variables. But we decided to take the other avenue. To remain blissfully unaware of anything that wasn’t discovered via routine examination and sonogram. In exchange for a happy pregnancy, ignorant of the unknowns, this is where you roll the dice on having the wind knocked out of you on the day of your child’s birth, which is supposed to be the apex of a gleeful, euphoric journey. We were aware of risks – age-wise we were in that demographic, after all, though barely. And, like most folks with otherwise uncomplicated pregnancies, healthy kids and healthy lifestyles, I’m sure we fit ourselves squarely into the “that won’t be us” camp. While the gamble played out how it did, I can honestly say that the pregnancy was wonderful. There are few things as kind on a man’s eyes as seeing the woman he loves beaming and swollen with his child, and for the entire six-month period we couldn’t get enough of each other. We got to go through the whole experience for what felt like the first time as true grown-ups and not burdened by absurd immaturity or college loans — we even seized the opportunity to do an addition on our house. For our growing family. Missus had the giddy pleasure of essentially designing and decorating her own dream space out of a three hundred square foot unfinished closet adjacent to our bedroom. We raised the low, vaulted ceiling and added natural light-giving windows and accent lighting. There is a custom-built storage bench that spans nearly the length of the room and another large closet for more storage. There is a light in there too, and a smaller door at the other end for easily accessing those hard-to-get-to storage bins shoved to the back. There’s even an in-wall ironing board. Half the area is good and proper craft space and sewing room. The other half is the nursery, done with antique white crib and furniture, oversized bookcases, (one stocked with Little Golden Books and other family favorites; the other with spools of ribbon and thread, jars filled with buttons, bottles of glue and paint). There doesn’t seem to be an inch of space not put to prudent use and both areas — sewing room and nursery, deemed separate although there is no wall — fit together better than seamlessly. The space quickly became another kind of family room, and may in fact be everyone’s new favorite thing about the place we love to call our home — part and parcel. I call it the Mom Cave. In the hours after Lucy’s diagnosis Missus had bouts of discomfort in the belly region, which the nurses would come and treat either with more pain medicine or sometimes massaging. These spells were dismissed early on as the understandable after effects of a natural childbirth, but as they persisted more and more pain meds were given. Eventually the fits passed. Now it was getting on toward eight or nine o’clock and it had been a good long while since Missus had had any pain. She said she was feeling better. Sleepy. The neonatologist had allowed Lucy to remain in our room receiving blow-by oxygen (there was still the hope that her oxygenation would pick up on its own) and while Missus couldn’t hold Lucy she was able to turn her head and gaze at her as she drifted in and out of sleep. The scare presumably over, the long, dizzying day seemed to be leveling off into something that felt more normal. More like what I remembered. Family began saying goodbyes and there was talk of food and whom the girls would ride home with and when everyone would be back to check on us the next day. When a nurse brought the dinner tray to Missus’ bedside my own stomach awoke from a daylong nap. Earlier my father had offered to buy me dinner back at their hotel if I was up for it and I had demurred, muttering something about grabbing some cafeteria food a little later. Now all of the sudden a steak didn’t sound bad. At all. The hotel was less than a mile away. And there was cause to celebrate, after all, wasn’t there? I had seen my third daughter born that day, and she was pink and beautiful. I asked Missus if she would mind if I snuck away for a quick bite with my dad, and then snuck right back. An hour tops. I said I absolutely would not go if she wanted me there with her. She didn’t hesitate to insist that I go and have dinner with my family. Michelle, her best friend, had just settled in to keep her company and between the meds and physical exhaustion she was quite ready to nap. She said she was feeling better now. Feeling much better. I kissed her and asked if she wanted or needed anything (of course she didn’t) and I walked out of the hospital with my sister and my daughters. I kissed and hugged them all goodnight and distinctly remember turning and walking through the long parking lot and toward my car, alone for the first time that day, and feeling very much like a changed man. Classic. Husband Of The Year goes off to a steak dinner thinking all’s swell, even lingers for the extra glass of good scotch, and meanwhile his wife is bleeding out on a hospital bed. Perfect. The Coronation is surely imminent. Gentleman, keep your seats. I was about twenty seconds from the door of our delivery room as I read the message and I soon walked into what I can only remember as a bad dream. Nurses were huddled around Missus’ bed and she, they, everyone in the room had the wrong kind of look on their faces. It looked as if her color had turned, and then turned again. Other nurses were still standing over Lucy, concerned that she was still only oxygenating in the low-eighties. They were going to consult with the neonatologist. No-Nonsense was being paged back for Missus. For the rest of the night I would pace back and forth the spinning room between Missus and Lucy, offering Missus my lamest “It’ll be okay/I love you” look whenever I could get an audience with her, and dialoguing with doctors and nurses in both camps as to what was happening, and what would happen next. When she arrived, No-Nonsense went to work scooping clots of blood out of Missus’ uterus. Think of the quivering mass of cranberry dressing on the plate after it’s been coaxed out of its can and you have an idea of the largest of these. When I finally got a face-to-face with No-Nonsense she informed me that Missus’ uterus was hemorrhaging – likely, it had been all afternoon, explaining her fits of pain — and that she would need emergency surgery if other measures didn’t work to stop the bleeding. Some minutes later I was face to face with the neonatologist again and being told that because Lucy’s oxygenation was not improving, she might need to be transferred to a hospital in Austin, possibly by helicopter. I remember clearly beginning a conversation with myself about where I would be if Missus were in surgery while our baby was on a helicopter headed to Austin — a conversation that never reached resolution. Some minutes after that Lucy was admitted to the NICU. Minutes later I started waking up family members to let them know what was happening at the hospital. A few minutes after that I pocket-dialed a kindly older man from my church who happened to have a special needs daughter of his own and who had stood in my shoes, had in-fact walked a lifetime in them. When he called me back I explained that I had dialed him accidentally, apologized if I’d woken him, and then answered that, yes, we’d had the baby that day and, well, actually, there was some stuff going on. I explained. We spoke some. I still think about this now and I feel deeply that I couldn’t have chanced to dialed a more perfect person to speak to at that moment. Some minutes later my mother and Missus’ mother and sister arrived. Minutes later my father arrived. Minutes after that I learned that Missus was still hemorrhaging some and that she would be going into surgery at approximately 2 a.m. to have a balloon inflated inside her uterus to apply pressure to the uterine wall which would hopefully stop the bleeding. If that didn’t work they would need to perform a hysterectomy. I thought to myself if a hysterectomy was worst-case scenario, we could certainly live with that. I’m not at all sure today that a hysterectomy truly was worst-case scenario. I’m not so certain that I was allowing myself to see or feel the possibility of a darker outcome. Minutes after that I was being told that Lucy would not be flown to Austin that night. She was doing just well enough, a senior doctor in Austin decided, that the echocardiogram could be done later. No need to add to the mother’s traumatic situation. Minutes after that I was standing in the NICU asking how it was possible that my daughter was eight hours old and had not yet been fed. Some minutes after that I was on the other side of the hospital, bent down over Missus, now numb with medicine and barely conscious, kissing her and praying over her before she was taken in to the operating room. 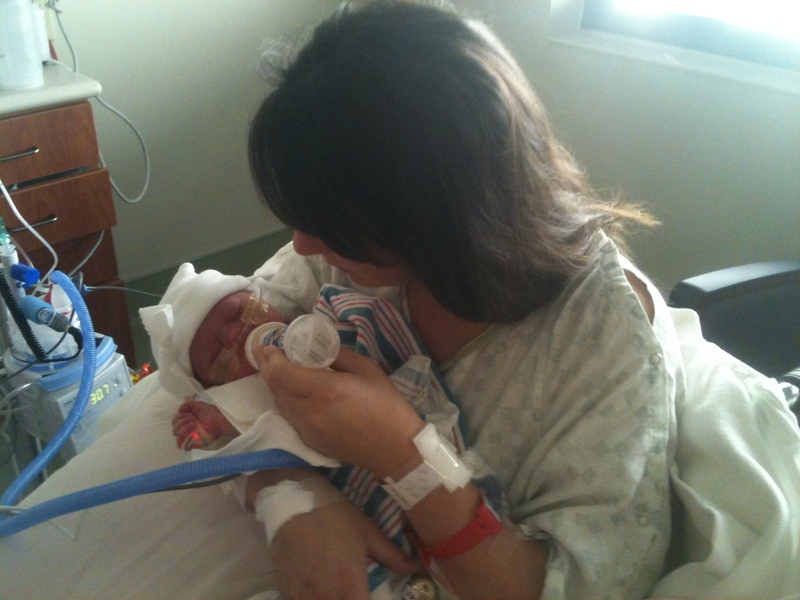 Minutes after that I was back on the other side of the hospital in the NICU feeding Lucy. The surgery worked. No need for the hysterectomy. In the following days, while Missus was on bed rest, more than one nurse would come to her bedside and say to her in quiet tones that of all of the doctors in the group she had gotten the right obstetrician, the one that they would have wanted given the seriousness of what had happened. Post-partum bleeding still takes more lives than you think. Still, it is uncommon for women to require blood transfusions of as many as two pints. Missus had needed close to three. They told her that God had been watching over her. Missus was brought to a recovery room at four in the morning, still not conscious. I fed Lucy another time before bedding down on the couch next to Missus’ bed. Nurses came in and out at various times of the morning but I was only vaguely aware of the lights going on and off and back on again. It felt good to be horizontal and barefoot. I had worn my good boots that day. The two-tone Lucchese’s I’d bought to wear on my wedding day, nearly fourteen years before, and that I’d worn on other special occasions, the deliveries of my other two daughters among them. I don’t spend a lot of time in cowboy boots anymore and I had put some miles on them that day and night, pin-balling between Missus and Lucy. My feet were glad to be rid of them. I think of that day as ending at about seven-thirty the next morning. I slept for three-and-a-half hours and went back to the NICU to check on Lucy. Whereas all the night long I had strode effortlessly in and out of the NICU with greetings and salutations, this time I was curtly denied entry via intercom. Shift change had occurred or was in progress, a new nurse was at the helm, and my face and voice were no longer recognized. I was flatly told to return in an hour. A few seconds later, when I verified, accusingly, that I was being told that I could not, then, see my daughter I was buzzed in. The Geico Doc was still there, had heard my voice over the speaker, and invited me in to meet his counterpart that was relieving him. When Missus woke I told her about Lucy and how she was doing well. That she was down the hall with us and not in Austin. That she was still not oxygenating fully on her own, but that the doctors were pleased to see her feeding (babies born with Down syndrome often struggle with feeding for a variety of reasons). I told her that so far Lucy was doing great and taking in plenty of milk. I spent about twenty minutes feeding her spoonfuls of ice and making trips back to the ice machine. Minutes after that the nurses were wheeling Missus down to the NICU. Some minutes later I stood in a doorway watching as Lucy, tethered to various machines and monitors by a web of sagging tubes and wiring was placed in Missus’ arms, and for a time the persistent, incessant beeping noises inverted to background in a smallish white room where warm, spring morning sun peered in through windows and over a soft shoulder and through brown-black hair, where she, my wife, sat in a wheelchair and a cotton gown looking tearfully, tranquilly down, in all her maternal majesty, at the baby girl nursing peacefully at her breast. You are currently reading Part One: Birth Day at On Loving Lucy.